Nowadays Citrix Web Interface is the most used way to access the Citrix Published Applications. The product evolved from the very basic NFuse to the current Web Interface 4.6. In previous versions it was pretty difficult to transform the website to the needs of the organization, especially because the code changed with every new release. During the time of the product evolvement you can now modify the basic look pretty easy via the Access Management Console. Via this option you can add your own logo, change the layout a bit and add custom text message for the welcome message and the footer text. Nevertheless there is still the need to modify the behavior of Web Interface. In this article I will show you some of the best modifications available out of the SBC community. First of all Citrix also have some modifications available for their own product. For example you can disable the right mouse button, change the logout behavior or change the presentation of the available Citrix Clients for downloading. Thomas Koetzing collected all the separate knowledge base articles on one page. Via this page you can easy find the official Citrix modifications available. Secondly the Citrix Consulting Services created some modification their selves, but they are mentioned on the Citrix Knowledgebase. A few of them will also be described in this article. Probably the most wanted modification is to display the Web Interface in the default language of the users (especially in Europe). 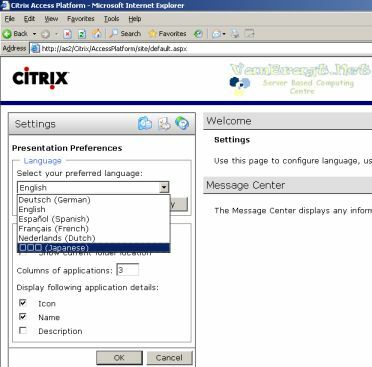 Since version 4.x Citrix created an easy way to make this possible, but you need to do the translation on your own. Happily the SBC community already did this job. Most available languages can be found at BrianMadden.com. Just download this wanted language pack, unpack the zipfile and copy the files into the directory (default directory) \Program Files\Citrix\Web Interface\4.x\languages. When the files are added to user can change his default languages via the Customize User Interface button. Select Presentation Preferences option and pick out of the drop down list the desired language. One of the most like modification by the end user is the Favorite Apps modification. 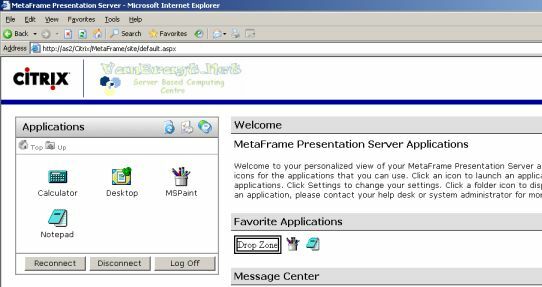 This modification makes it possible for the user to select applications out of the default application list into a separate part into the right pane. Very useful when many published applications are published and the user would like to have a kind of quick launch for their most used applications. To enable this feature five file need to be replaced or added, followed by a reset of the Internet Information Service. The user can drag and drop the shortcuts from the default application list into the Favorite Applications Drop Zone. When the application is dropped in this zone a small icon will be displayed beside this drop zone. There is a maximum of application shortcuts that can be added to this component. What you should remember is that removed applications (by the administrators) will not be displayed in the favorite zone, but still consume one space in this component. Unfortunate this modification is not available for the latest Web Interface version (4.5/4.6). Often I got the question from customer if it is possible to hide some applications from the Web Interface hosting the external connections (from the Internet) because those applications are hosting confidential information that should be kept into the company. By default Web Interface display all application, but with the modification HideApps you can manage the display of applications. 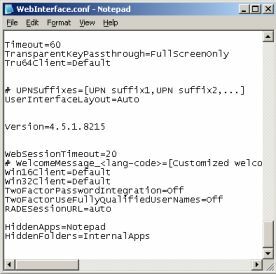 To accomplish this you should add some lines to the code by copying the corresponding file to the Web Interface website directory and add two lines to webinterface.conf (in the conf directory) named HiddenApps= and HiddenFolders=. 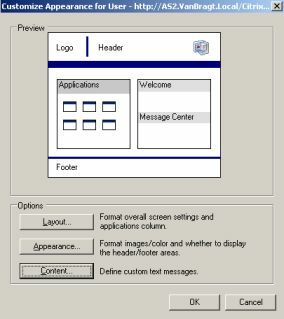 Specify the folders and/or applications that should not be displayed into the Web Interface and the users won't see that applications anymore. I really like this wonderful and easy to implement modification. I will continue this article in Part two, which will be published next month.